For those who haven’t had the privilege of a great deal of global travel, nepotism at this scale is considered perfectly normal in most African states and other nations ruled by dictators, warlords and other corrupt leaders. What makes it noteworthy is that it is not the norm, and is even considered illegal in most democratic states. But, what else should we expect from the biggest #BLOTUS ever elected? 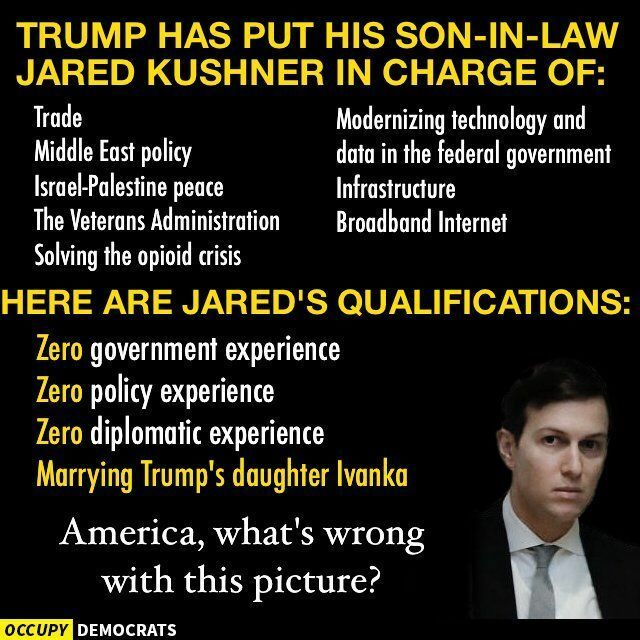 This entry was posted in Facts & Statistics, News & Views, Quotes and tagged BLOTUS, corruption, dictators, diplomacy, government experience, Israel, Ivanka Trump, Jared Kushner, Middle East policy, opioid crisis, Palestine, peace, policy, qualifications, son-in-law, trade, Veterans Administration, warlords on October 17, 2017 by Ray Buchanan.